One of the things that I really like about this time of year is the winter squash and butternut squash is one of favorites. Near the end of last winter I started thinking about a butternut squash lasagna but then Spring started and all thoughts of squash were pushed from my mind by the fresh asparagus. The butternut lasagna has been on my mind since the squash returned and now I finally got around to making it. I wanted to keep the lasagna pretty simple to showcase the amazing flavour of the butternut. I knew that I wanted to roast the squash to maximize its flavour and sage was a must. Other than the squash there was to be a bechamel sauce and since this was going to be it I decided to saute some onions, garlic and more sage in the butter while I was making the sauce for a bit of extra flavour. I also thought long and hard about adding a layer of spinach or chard but in the end I wanted to really taste the butternut squash so I had the spinach on the side. Lasagna takes a bit of work to make. For this one, you need to roast the squash, make the bechamel sauce, cook the noodles, assemble and cook. Despite all of the steps involved and the time required it was pretty easy to make. The roasted butternut squash lasagna turned out really well. The cheese on top bubbled and turned golden brown forming a tasty crust. The lasagna tasted great and the flavours of the butternut squash and sage came through well! The sweetness of the squash went really in the creamy and cheesy lasagna. While I was eating the lasagna I was already thinking of the next version and I was thinking about adding that layer of spinach and maybe a meat layer consisting of tasty Italian sausage. Toss the butternut squash with the olive oil, balsamic vinegar, sage, salt and pepper. Roast in a preheated 400F/200C oven until caramelized, about 30 minutes, tossing after 15 minutes. Add the garlic and and sage saute until fragrant, about 1 minute. Sprinkle in the flour and mix while cooking until it is bubbling and a little browned. Stir in the milk and season with nutmeg, salt and pepper and heat until it thickens. Spread 1/2 cup of the sauce on the bottom of a 9 inch square baking pan. Add a layer of 3 lasagne noodles. Spread half of the butter nut squash on top. Spread 1/3 of the mozzarella cheese on top. Spread 1 cup of the sauce on top. Spread the remaining butternut squash on top. Spread the remaining sauce on top. Top with the remaining mozzarella and the parmigiano reggiano. Bake in a preheated 350F/180C oven until golden brown on top and bubbling, about 30-45 minutes. What a lovely lasagna, so nice to this time of the year! I love the big chunks of squash in this lasagna. Looks terrific!! Happy Thanksgiving!! Oh my, that looks insanely delicious – fabulous!! Yum! You are right that sausage would also be good in this. Very flavorful! I love that wonderful combo! I love the different ideas you come up with. This one sounds wonderful. Happy (American) thanksgiving Kevin! I’m glad the squash was able to keep its body after being both roasted and steamed inside the lasagna itself. I also like how beautiful the layer look in that lasagna! gorgeous chunks of squash in there!!! That looks amazing! I wish I had your metabolism! Oh my god Kevin, that is just stunning. It’s funny, but whenever I’m on tastespotting I always see your recipes and just fall in love with them, and then when I click and am sent here I’m never surprised. That looks like a perfect fall/winter meal. I like how you cubed the squash instead of mashing it all together. I just made almost the same thing off of another recipe I saw on a blog a few weeks ago. It was fabulous and the guys LOVED it. It’s definitely something I’ll do again. I love lasagna and the beauty of it is there’s so much room to experiment. This looks like a really tasty spin on a classic! I love, love, love butternut squash. Thank you for another recipe and excuse to make some! 🙂 Looks delish. Nicely done, I’d really like to try this lasagne recipe. Just look at those beautiful chunks of BN squash. Love it! Definitely one of my favorite ingredients of the season. Butternut squash in lasagna.. I’m in! I love this lasagna. Although that “takes a bit of work” is deterring me. 😉 But it’s beautiful. I am not even a fan of butternut squash, but that looks great! Beautiful! That looks like the perfect slice of lasagna. I love what you did to your site. Oooh Kevin – what a beautiful lasagna. I love the big chunks of butternut squash. Great recipe. goodness me that looks fantastic! i need to go meself some butternut squash! very seasonal and delicious looking. I like you have left the squash in chunks. This is a stunning lasagna Kevin, I love the colors and the flavors sound incredible. I like where you are going with the second version also….spinach, sausage. I will have to make this the next time my veggie friends come over. now that is a work of art! 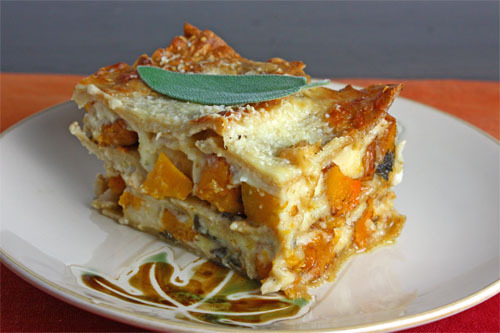 I’ve been looking for a good squash lasagna recipe – looks like this one may fit the bill. Yum! I stumbled across this recipe while looking through some of your older posts; it looks amazing. Butternut squash isn’t out of season, so I’m going to make this dish for Super Bowl Sunday (with thinly sliced prosciutto and roasted dates to go inside as well).